Pierres & Vacances has carefully selected the Departement of Moselle, in Lorraine, as the perfect location to host the 4th French Center Parcs, the Domaine du Bois des Harcholins. 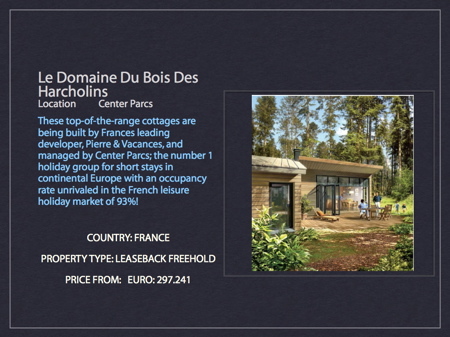 These top-of-the-range cottages are being built by Frances leading developer, Pierre & Vacances, and managed by Center Parcs; the number 1 holiday group for short stays in continental Europe with an occupancy rate unrivalled in the French leisure holiday market of 93%! The `Domaine du Bois des Harcholins` will include 870 contemporary 2 - 4 bedroom cottages. There are 3 award-winning designs to choose from: Premier, Comfort and VIP. This is a superb opportunity to acquire a top-of-the-range cottage built by Pierre & Vacances Group and managed by Center Parcs. All properties benefit from high quality furnishings, bright interiors, LCD TV screens, inviting fireplaces, saunas & Jacuzzis (VIP only), generous private terraces and wide bay windows overlooking the forest. As well as accessibility to the extensive range of indoor and outdoor facilities onsite. Only 2% reservation deposit secures! At the heart of the Lorraine region, the Moselle is an unbeatable and extremely reputable tourist destination, with its 300km of walking trails, the European Archaeology Park, many fortified churches and castles, inclined planes, etc. * At the gateway to 3 European countries: Belguim, Luxembourg and Germany within 3 hours drive of 17 million people! There is an extensive range of quality leisure facilities onsite that make this the ultimate activity holiday destination, including: water park, tropical jungle, spa, sports hall and restaurants. As well as horse riding, mountain biking, adventure trails, orienteering, tennis, mini-golf, trekking, climbing, archery, etc. As part of the French Government Leaseback scheme, all purchasers will benefit from a 19.6% VAT refund and the complete peace of mind of a guaranteed rental income and totally hands-off management service. Furthermore, purchasers will benefit from an additional subsidy given by the Moselle General Council, of approximately 8%! These high-specification cottagess are fully-furnished to a high-specification with a range of 5 flexible personal usage options and guaranteed rental yields up to 4.5%. They will enjoy bright interiors with generous lounge areas with fireplace, wide bay windows, large private terraces overlooking the picturesque forest, and saunas or hammams with the VIP cottages. All properties have been designed by renowned architect: Jean de Gastines. The security of this investment is second to none, as purchasers can be assured that Pierre & Vacances are the European leader in leisure property. Partnered with Center Parcs; the number 1 holiday group in Europe with an unrivalled occupancy rate of 93%, provide the confidence that your investment will secure you exceptional returns and the perfect all year round holiday destination. * Demand is primarily driven by the high, long term, secure rental returns all year round due to quick and easy accessibility and the extensive range of quality facilities on offer. * The concept is immune to the traditional holiday variable of climate (e.g. snow coverage, heat waves, other environmental changes). The Dome maintains an annual average temperature of 29�C. As the publicity in the EU goes � it`s the holiday the weather can`t spoil. * Center Parcs has set an unprecedented benchmark for stable holiday investment properties of the future! * Guaranteed rental income for minimum 30 years and this is index-linked EVERY year! * In an ever more environmentally conscious society, the high ecological standard set by Center Parcs, will become increasingly sought after in years to come. * At the heart of a 450 hectare forest this is a vehicle-free village which has been awarded the highest environmental standards certificate and set a benchmark in the tourism industry that others will struggle to match. * They have also formed a partnership with the global charity, WWF (world wildlife fund) to help raise global awareness of environmental issues. In essence, you are the owner of a top quality freehold cottage benefiting from the total peace of mind of guaranteed rental returns without the hassle of management � and with the added benefit of free and discounted holidays at ANY of Center Parcs and Pierre & Vacances resorts throughout Europe! This project is the first of its kind to be available to EU investors. As a result, we have experienced a great deal of interest, so please call our specialist consultant to learn more about this excellent holiday home investment opportunity.